Get there in chic style with total protection thanks to the guru of functional fashion. Forget the hassle of unpacking with an upright that becomes a mobile dresser. 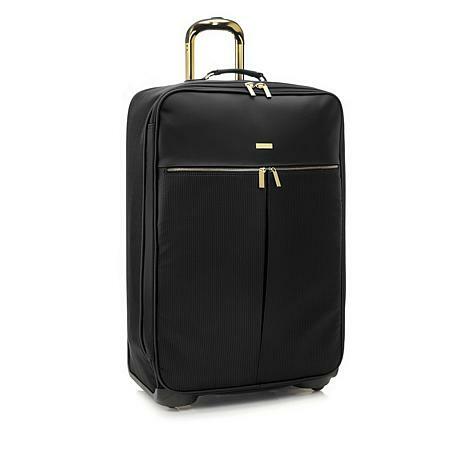 Designed with a lightweight durable waterproof, abrasion-resistant and puncture-resistant nylon TuffTech exterior, this luggage set stands up to the rigors of travel and the SpinBall wheels ensure you can maneuver your belongings throughout the airport with ease. These sophisticated features make this piece a must have for any getaway. Piece Weight: Approx. 11.7 lbs. Purchased in Black to go with the 3-Pc. and it's soo pretty. All of the colors are soo pretty but I settled on the Black. Since I don't fly anymore, this luggage will be for road trips only so I won't have to worry about it getting banged up. It's very roomy and everything is as described in the presentation. Pricey for 1 piece but worth it to go with my 3 pc. set. Thank You HSN & Joy. Love this matching piece to the rest of my set. Fits 2 weeks of dresses and Suits for a cruise. So many pockets and bags that I always overpack since I have the room. Beautiful gold hardware. Always the best looking luggage of any when I travel. Just add a bottom handle and I wouldnt change a thing. This piece of pink blush Luggage was so great on my vacation. I had no problems with the zippers! It has lots of room. I flew 4 times in 10 days different airports and it did just fine. The handle at the top is sturdy!!! I love the color! I have some recommendations: 1. Fold the cover under so it never touches the wheels 2. Do not let others carry your bag unless you should them how the wheels work 3. Buy the matching set (the weekender is awesome). Weekender can fix under seat when flying! I ordered this xl suitcase in black and its beautiful. Zippers all work well and it rolls with ease. 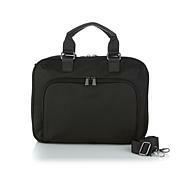 I purchased this and the rolling duffle and am thrilled with the organization, extra room, style and functionality. Thank you, Joy. 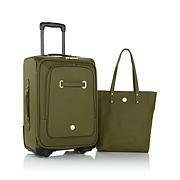 I loved it so much I just went back and ordered the matching weekender. Took it on a long trip with multiple flights. Purchased the Bronze set and it held up okay. No side handles, so difficult to pick up as the bottom strap is not easy to get to. Got really dirty and marked up and I still haven't gotten it clean. Pretty lightweight though which is a plus. School, the gym, the park, the office ... you have to carry your whole life around wherever you go! 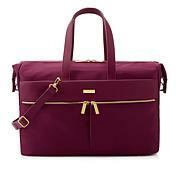 Tote your essentials in style with this soft, lightweight duffle bag. It folds up flat for storage and offers the perfect portable piece to help you get to all of your destinations with ease.